Move over iced latte. 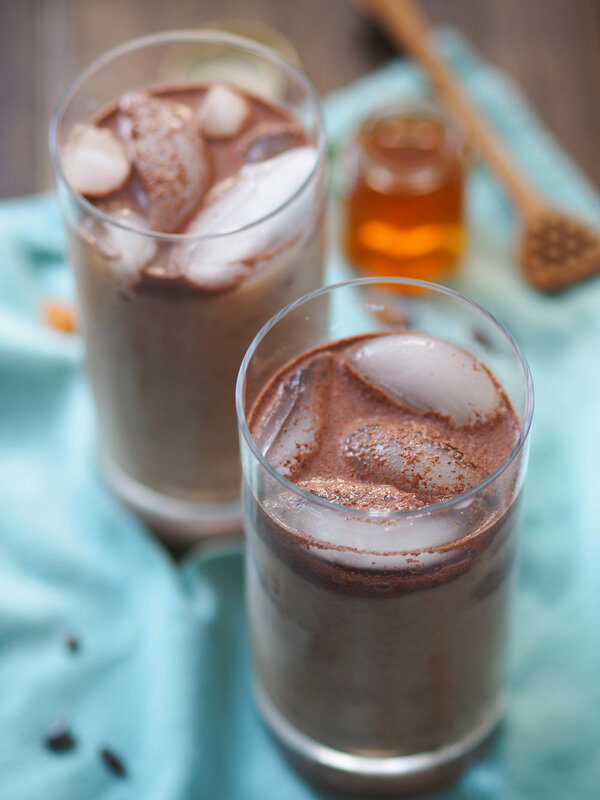 Meet my new drink of the summer, this iced spiced stone ground chocolate drink. Last year, the hubs and I had a brief stop in Boston before driving up to Portland for a friend's wedding. I shared some eats from our trip here, plus tips for intuitive eating on vacation. When in Boston, a city I've visited quite a bit over the past few years between conferences, weddings, and visiting my brother and his growing family, I always stop at the Boston Public Market, a food hall downtown. Every time I go I try something new! In case you're making a trip, my must eat is the smoked bluefish roll at Boston Smoked Fish Company. At that visit, it was an insanely hot day, and I was really dehydrated from flying early that morning, so the cold stone ground chocolate drink from Taza Chocolate Bar was calling my name. I swear it was the most refreshing thing I ever tasted. Think to an experience you've had where you're eating the exact thing both your body and tastebuds needed in the moment, and that was how I felt drinking it. I remember getting to the bottom of my drink and seriously contemplating going back to get another! The next time I went back it was like 10 degrees outside and I still got another because it was so good! When I asked for my drink cold, the guy working there squinted his eyes, tilted his head and gave me a look like I had lost my mind. If you haven't been to their chocolate bar before, they've got a ton of huge bowls of spices and ground chocolate laying out on the counter that they use to whip up delicious chocolate drinks. It smells like chocolatey heaven walking by. I loved watching them take big scoops of everything and throwing it into a mixer to blend it all up. When I saw rounds of Taza chocolate back home, I was inspired to try and recreate the drink. You could use any dark chocolate you like, or even milk chocolate, but I really think the bitter flavor of dark chocolate would go much better with this. 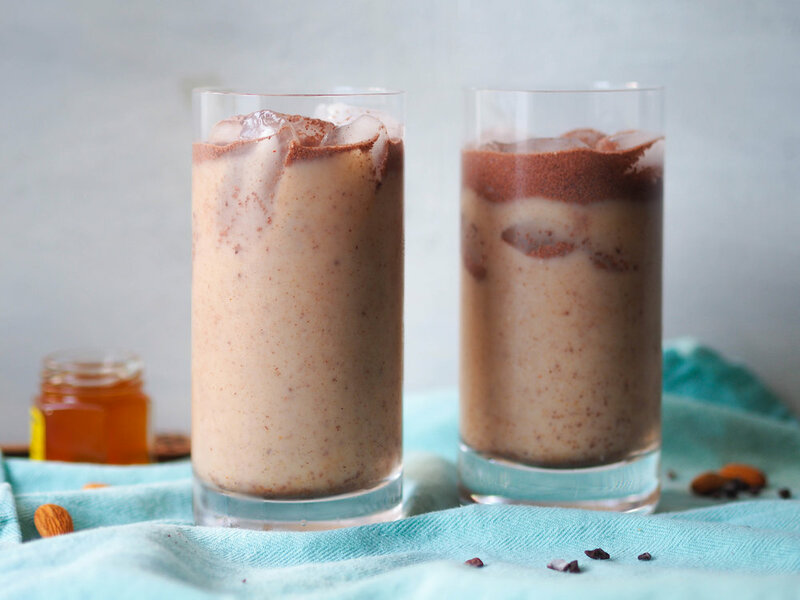 One of my favorite parts of the drink was the crunchy bits of cacao that were in it, so I wouldn't cheat yourself of that! I used the medium holes on a cheese grater to grind the Taza chocolate so it would mix into my drink, but still have some crunch. I loved how the drink I had in Boston was spiced with chili like the OG chocolate drinks. Chocolate drinks were first created by the Mayans and were typically an unsweetened blend of chocolate, chilies, cornmeal and water. Chocolate and chiles may sound odd, but it's really delicious. In the Taza drink they used guajillo chili, which has a fruity, sweet taste, so use that if you happen to have guajillo chili powder laying around. I don't, so I used a pinch of cayenne. I also added cinnamon, vanilla and almond extract, as well as maca powder, which is optional in this recipe. Maca is the ground root of a South American plant that has a really delicious malty, earthy flavor. 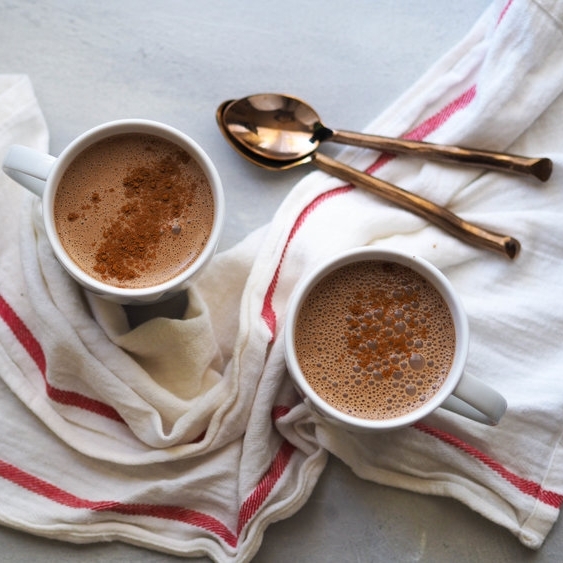 It's been used for centuries for hormonal support and energy, and while there's not a ton of research to back that, I've personally noticed about a coffee cups worth of energy when I have it in a smoothie. Speaking of smoothies, I think this drink would be really tasty in smoothie form. If you do it, let me know how it goes! Grate the chocolate on the medium holes on the cheese grater. Add ground chocolate, honey, maca powder, extracts, spices and milk to a cocktail shaker and shake until combined. Add a couple cubes of ice and shake again to chill.